Tales in the tavern is an event fit for the entire family, all can enjoy activities held within Fort Randolph. POINT PLEASANT — As Halloween approaches, many people are searching out different ways to celebrate this harvest season. During Fort Randolph’s Harvest Fest and Tales in the Tavern, visitors at the fort will be able to listen to stories that Fort Randolph Committee Member Ed Cromley described as having more of a thrilling nature than a scary one, punching a surprise twist at the end. Many of the stories will be set in the colonial era. All of the stories will be suitable for children as this event is all-around family friendly. The event is set for Saturday, Oct. 27 from 4-8 p.m. at Fort Randolph located inside Krodel Park in Point Pleasant and is put on by the Fort Randolph Committee. As with several events at Fort Randolph, this event is free of charge, but donations to the fort are welcomed and appreciated. People will be able to explore the grounds of the fort, seeing re-enactors busy with various activities. Food, such as beans, will be cooked on an open flame and other snacks will be available as well. The telling of the tales will begin at 7 p.m. Craig Hesson will be one of the storytellers for the evening and Cromley commented if an individual has an applicable tale to share, they are welcome to offer their story as suggestion to committee members. The stories must be family oriented and can either be set in the colonial era or of a generic time setting. A gentleman was even welcomed to sing a song during this sharing hour last year. “We like to get together at the fort and have a good time,” said Cromley. 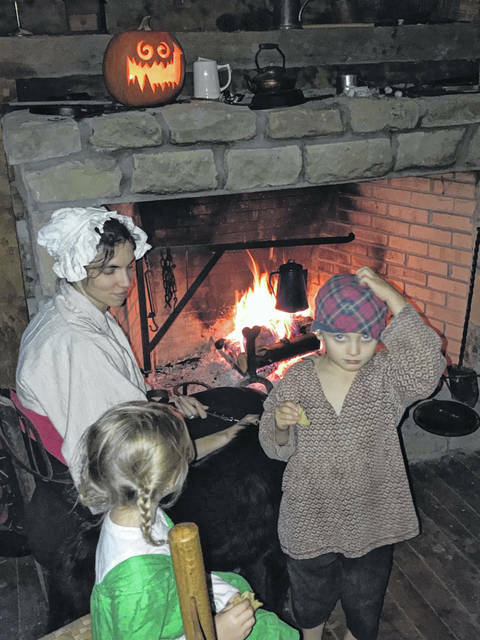 Harvest Fest and Tales in the Tavern is another opportunity for the residents, as well as visitors of Mason County to come and visit Fort Randolph. The last time the fort was open, during Liberty Days.